I’d expected to pass several Sustrans mileposts today, but not anywhere near the number that I ended up passing. If you read the words on most of the milepost designs you’ll see that 1000 were funded by the Royal Bank of Scotland as a millennium project. Actually there a few more than that as local authorities etc. have funded a few privately. I passed 13 mileposts today. So over 1% of all of those on the National Cycle Network. I covered over 70 miles today (the NCN had about 12,000 miles in total the last I knew), so it shows that the mileposts are quite disproptionately placed around the network — I should have only expected half of the number of mileposts that I actually saw. It’ll be great for OSM’s mapping when I get the data online though, especially as much of today’s route didn’t seem to be mapped yet, based upon what I saw on my Garmin GPS’s display (admittedly several weeks out of sync with the main OSM database now). The weather was actually pretty good today, despite the forecast for showers. In reality hardly any spots of rain and quite a bit of pleasantly warm sunshine. Now that my brakes are working as they should again it was a highly enjoyable day of cycling, especially as the distance was back to a longer run again. Near to the end of the day’s journey there’s a split in NCR1, so as I was having fund and had some spare time I decided to cycle both braids to ensure that they’ll be mapped. When I got to my accomodation in Banff there turned out to be some unexpected miles appended to my journey though. It turns out that they’d accidentally double-booked my room. They had tried to contact my home number, but of course I’ve been on the road for several weeks now, so missed those messages. They did helpfully arrange me some alternative equivalent accomodation in the adjacent town of MacDuff though, and luckily that’s not much further to cycle (in fact it’s not very far from part of the planned route for tomorrow). So, I’m now writing this posting from MacDuff instead of the expected Banff. I did get a large £20 donation from the B&B owner in Banff for the British Heart Foundation, whom I raising funds for by doing this ride. Thanks on behalf of both myself and the BHF for that. The mileage was fairly low again today. That’s lucky because my brake pads have been wearing very thin, so needed replacing. I didn’t manage to find the bike shops in Inverness, but did find one in Nairn, today’s destination. So, now I can brake more confidently again, rather than having to plan for hills to perform my braking for me. In Inverness I revisited the railway station. I looked there on my way north aware that there should be a Sustrans milepost somewhere there, but I couldn’t find it. The motorcyclists I met several days ago at the Crask Inn said that they’d seen it near the cycle parking at the station. So, I looked a bit harder this time. The difficult bit was finding the cycle parking (which turned out to be on platform 6/7). After that the milepost was easy. This one’s a Mills type and is little unusual in that it doesn’t have destinations written on either of the branches of the tree (The artwork is called the Fossil Tree). I guess the destinations could be a bit confusing given that the milepost isn’t at all aligned with the cycle route itself, which is in fact a few hundred metres away. On the way out of Inverness eastwards both NCR1 and NCR7 followed the same path. This was retracing my route from when I’d passed through several days ago. 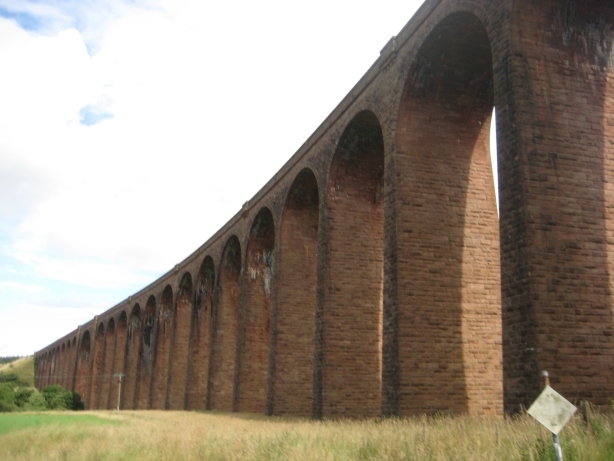 NCR1 diverges from NCR7 near the Clava Cairns, and you’re rewarded with a view of a viaduct pretty much straight away before the route climbs into the hills. 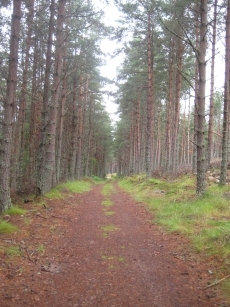 The route is very quiet here and soon runs along roads through various forests before descending down to Nairn. In Nairn it joins the riverside and I left the route soon after to go and find my accomodation and the bike shop “Bike Bug”. Tomorrow’s distance will be almost double today’s, so should go some way to restoring my average for the last few days. 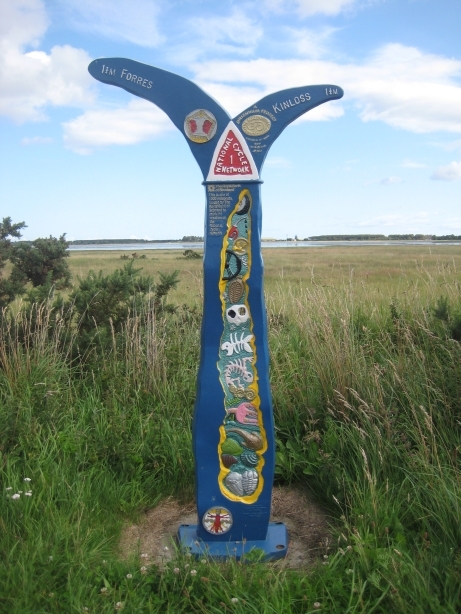 I expect to see several Sustrans mileposts along this stretch, so I’ll have fun photographing and mapping those as well as passing through several fairly well-known Scottish towns along the way such as Kinloss and Elgin before arriving at Banff. The trip today was intentionally quite short. 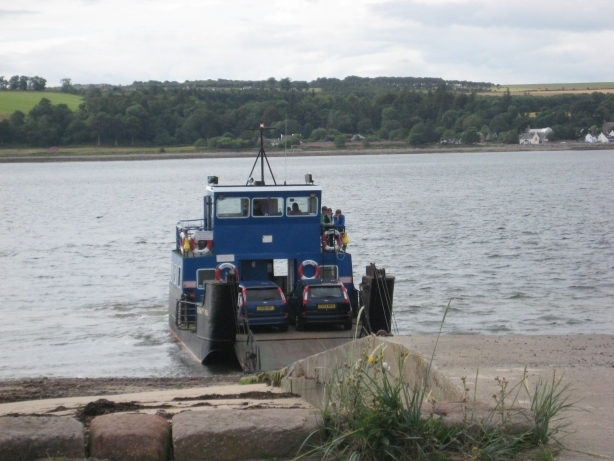 It included a short ferry crossing from Nigg to Cromarty, enabling me to map an alternative braid of National Cycle Route 1. The route was kept short in case the ferry disrupted my plans — not running due to poor weather, etc. As it turns out the weather was fine and the service quick. Whilst waiting for the ferry I met two other cyclists. They’d just started a 12-day John O’Groats to Land’s End trip and they’re camping. I warned them that the hills in the west country are the nasty ones, rather than those in Scotland. I had a little rain during the trip today, but not as heavy as was forecast. It turned out quite warm a bit later on. Most of today was spent following the A9. It’s not a particularly pleasant road to cycle on with lots of panniers, but there isn’t really any other choice of road for most of today’s journey. The Berriedale Braes were pretty tough — a lengthy 13% gradient down followed by a lengthy 13% gradient up again. I was pleased that I managed it without walking though. Near the end of the day I was able to take an alternative to the A9 for a little while. The alternative took me along the southern shore of Loch Fleet, then swung southward to Dornoch, before finally rejoining the A9 to cross via Dornoch Firth bridge. On the latter portion of this diversion I was lucky to hear the screeching of some birds of prey. I spotted them soon after and managed to capture a photo as they flew overhead. 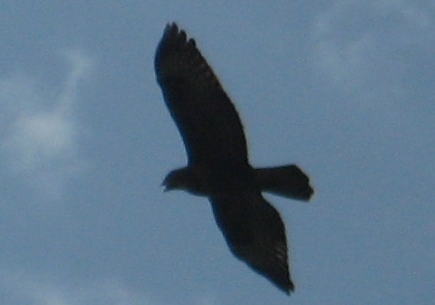 I’ve managed to see some birds of prey on several of my previous cycling days in Scotland, but unfortunately they didn’t get close enough to be discernable in my photographs (I’m only carrying a small point-and-shoot camera). Whilst cycling around the Orkney Islands yesterday I had a second spoke break on my rear wheel. So my route today was changed to call by a cycle shop back in Thurso, which I passed in my previous cycling day. 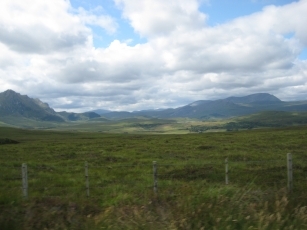 After Thurso I cut back to my planned route via the A9 and the B874. 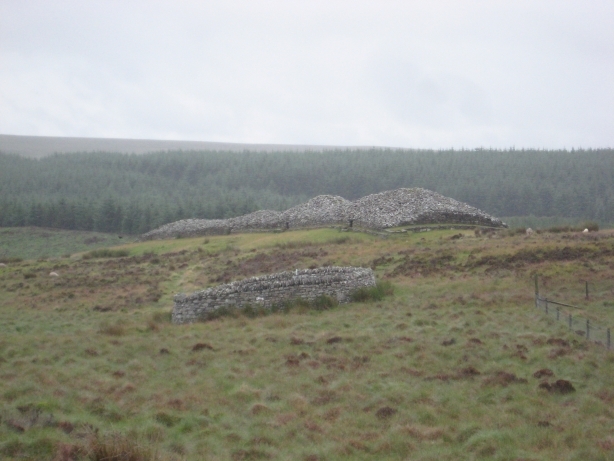 Back on my planned route I came down an exceptionally quiet road and passed the Grey Cairns of Camster, shown in the photo. The weather was particularly grotty for cycling today. Rain and quite dark this morning, followed by lighter rain but stronger winds this afternoon. This evening has brightened up nicely though, and tomorrow’s forecast looks good (Luckily — I didn’t fancy doing a day on the A9 in bad weather). The lack of Internet access is getting pretty frustrating now, but according to my plans I should be able to get WiFi access again at my accomodation in a few days time. So, there’ll be a burst of activity as several of my blog postings go online, I upload my pending OpenStreetMap changes (after resolving the conflicts between my offline copy and the current data, which there are bound to be), and downloading my backlog of emails, and downloading some more data in JOSM to be able to work offline again (I didn’t download anywhere near enough data to cover this current inability to access the Internet. But then JOSM is far too slow for me on my netbook if I download anything more than a couple of day’s worth of my cycling coverage). It was a relatively flat ride over to John O’Groats today, following National Cycle Route 1 all of the way. When I arrived Volvo were filming a commercial at the John O’Groats sign; they’d driven a low-emissions car from Land’s End to John O’Groats on less than a single tank of fuel. Their filming used lots of time at the sign, so it was quite a while before I was able to get my photo taken. I hope that they made a substantial, and preferably charitable, donation for the time they spent at the sign. On my way back from the John O’Groats signpost site I met a cyclist from Stevenage Cycling Club (Stevenage is close to where I grew up). 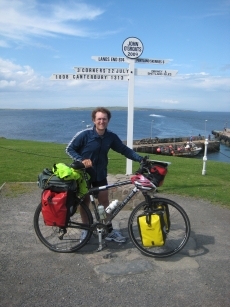 He’d just cycled a six day Land’s End to John O’Groats trip, covering approximately 150 miles per day. He admitted that he didn’t really get much time for site seeing at that level of cycling. I’ve got a rest day tomorrow, but I’m not going to spend it resting completely. Given that I’m so close by to the Orkney isles, I’m going to take the ferry over for the day and map part of National Cycle Route 1 over there. I’m getting a bit frustrated with my lack of Internet connectivity, and thus my inability to make blog postings. My mobile connection is extremely slow and not reliable enough in these areas of low signal strength. The call terminates after a minute or two — hardly long enough to load a single web page at this speed. I woke up to a bright, clear, and sunny day this morning. 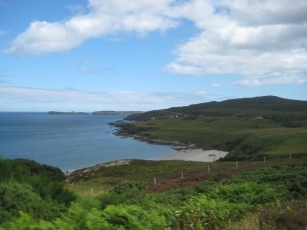 This showed the scenery surrounding the Crask Inn to its best, so I stopped frequently taking photographs along my way towards Tongue, on the north coast of Scotland. The route today was fairly hilly throughout and I had to take some of the climbs gradually to avoid feeling worn out by only halfway up. By playing mental games with myself (like looking at the spot heights on the OS map I have and comparing them with the height shown by the GPS) I took my concentration off of the climbs enough that I’d achieved most of them without really realising. At Bettyhill I again met the young couple I’d met yesterday. We chatted again for a bit, then leapfroged each other as we continued eastward. It’ll be their last day of cycling in their journey today, as they’re taking the train back from Thurso. They passed me near my accomodation in Melvich with about 10 or 11 miles to go to Thurso, but I don’t think they realised it. Anyway, I hope you’ve had a great trip! Today’s route started out passing through a few small villages. 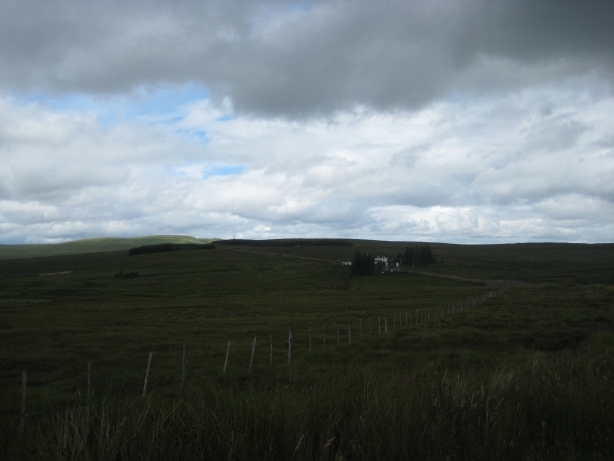 After about 20 miles I reached Lairg, and after that just a small scattering of buildings. I was following the A836 at this point, used by National Cycle Route 1. A little further along this meets with the A838, and from this point the A836 becomes a single track road with passing places every so often. Also from this point I didn’t encounter another building until I reached my accomodation at the Crask Inn, perhaps 9 or 10 miles further along. En-route on this final stretch I passed four cyclists, two pulling trailers and a young couple with panniers. In the same stretch only 23 motor vehicles passed me. It’s a quiet road; not your typical A-road. I played leapfrog with the couple when I stopped to take photos or let vehicles pass. They stopped at the Crask Inn as well as me and we got chatting. They’re doing their own ambitious journey — a Coast to Coast. In this case a south coast (Eastbourne) to north coast. We chatted about their route and my route and I showed them my detailed route plans and elevation profiles. I also told them about OpenStreetMap and OpenCycleMap. A little later I got chatting with a woman from the Netherlands who now works at the Crask Inn, and after that chatted with a cyclist who’d stopped at the Crask Inn on his way south. 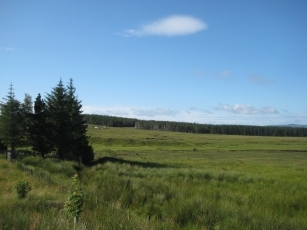 In the early evening a couple doing driving day tours based out of Lairg chatted with me. It turned out that the lady’s father worked for the Ordnance Survey, so we discussed mapping and OpenStreetMap for quite a bit as well as my trip. Approaching dinner I chatted with a couple of motorcyclists that are participating in a rally, with targets hundreds of miles apart. They expect to have completed about 3000 miles on their machines by the time they complete. I cycled through Inverness today, then out onto the Black Isle via the Kessock Bridge. By this point I’d finished following National Cycle Route 7 and was following just National Cycle Route 1, which I’ll now be following all of the way to John O’Groats. On the way out of Alness I met a group of cyclists doing their own Land’s End to John O’Groats trip. There were originally 16 of them, but they’re now down to 12. I chatted with them whilst cycling along for a bit, then kept pace with them for quite a while before they stopped at a convenience shop. I stopped also and we chatted some more about my journey, their journey, maps, etc. They then set off again, but I didn’t try to keep apace with them this time, because I wouldn’t be able to for much longer — they’re travelling with minimal on-bike luggage because they’ve got a support vehicle, whereas I’m carrying everything myself. Tain has proven to be a nice town and I arrived with a bit of time to spare. So, after checking in at my accomodation I went out to get some more food and drink provisions to carry on the bike. The reasoning being that tomorrow’s journey will be through a very sparsely populated area, so I’ll not be able to get anything on the road. 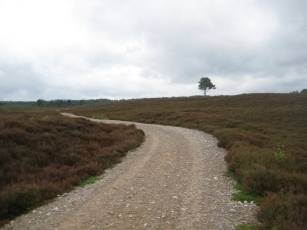 There were a number of choices of route whilst following NCR7 today; the route splits into several braids. I took the braids that were mainly traffic-free, but this did mean that the distance was slightly longer, there was a little more climbing, and the loose surface slowed me down a bit. I preferred the scenery this way though. Whilst cycling through several of the forested parts of today’s route I noticed that many of the trees had what looks like a silver-green fungal growth on them. The portions of the trees with the growth appeared to be dying, so it looks like it’s predatory rather than symbiotic in nature. One of the things I hadn’t planned for on this trip was the wear to my shoes. The soles of my shoes are wearing quite thin in places now and I’m sure that it’s only a matter of days before a hole forms. So, I’ll be looking out for a place to purchase some new shoes.